After our big storm, which left nearly a foot of snow, I was ready to call it. We’ve had a great season, and finding birds has always been hard for me once the snow flies. I read at least one blog, though (especially Tucker’s Chukars), whose author does not appear to be impeded by sub-freezing precip. And after last Friday’s debacle, which left Angus and Peat rather lacerated and on the DL, this weekend kind of dragged on into a dreary, slate-skied Sunday. I had to get out. Couldn’t take Angus because of his stitches, so tricked him into a walk with Leslie while I put Peat in the truck and got ready. Drove into Hells Canyon, where I haven’t been for quite a while, and watched a couple chukar sail over my windshield before deciding it might be thoughtful to get out. About 8 inches of snow covered the slope and its rocky exoskeleton. Hiking along a tight draw with brush, five minutes into the walk, Peat pointed. It was like that for the next two hours. I saw more birds than I think I’ve seen in the snow before, and got lots of good shots and a bunch of chukar. Hunting alone with Peat, on a stormy pre-winter day in that terrain, with the kind of action we had, really can’t be beat. 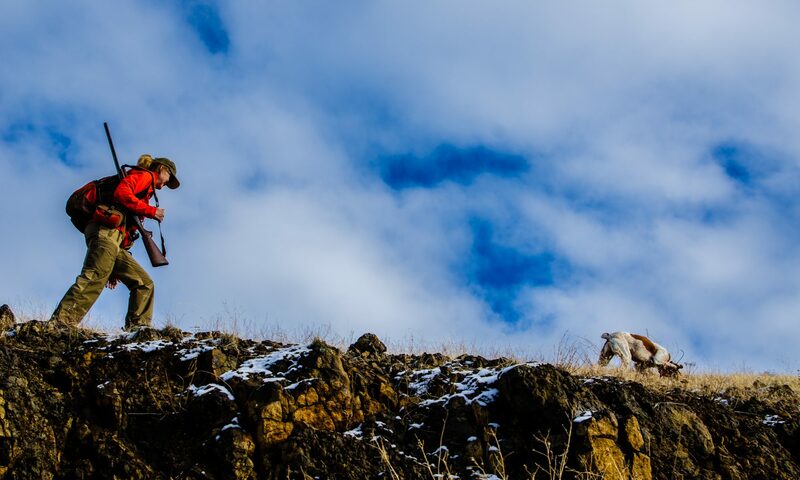 It was fair chase: the chukar could see me coming a mile away, as I could see them running up snowy slopes to rocky outcroppings and brush-filled draws. Usually they beat us, but I got more than I need or expected to get, much less see. And Peat performed beautifully, wearing his protective vest for the first time. A very good day. Where do birds go when they’re cold? I wondered this yesterday as I walked alone across Friendship Bridge in Boise and looked down at the mallards preening themselves in the river. On the road home today after hunting I saw a quail puffed up like a volleyball, right on the road just off the margin of snow. I wanted to stop and cuddle it. Nope. We’ve messed up plenty of window sills all over Idaho! Great job, Peat. Bob, I thought I was the only one who had to trick my dog’s so I could leave the house without them. Thanks, Larry. Yeah, it’s a production, isn’t it? I’m afraid this will become more common next year when Angus hits 10. Really enjoying your blog. After hunting pheasants over spaniels for years, I’m starting to focus on Chukar now that I have a GWP. She runs too big for the heavy cover I’m used to hunting. Plus, I love/hate the leg workout! Keep the pics and video coming. Learning a ton. Thanks, John. Yeah, the love/hate relationship finds its way into numerous aspects of this “pastime.” Enjoy the shift, and improved cardiovascular system!